Now through January 11th, save 25% on all sized Banners. 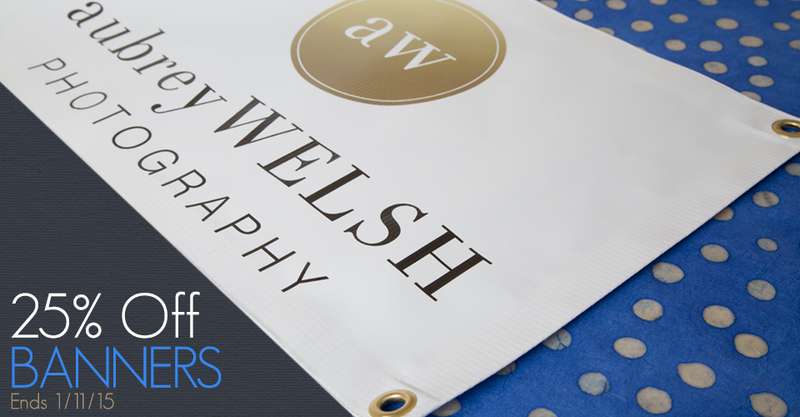 Make a statement with a professional quality Banner. Waterproof and highly versatile, Banners are a wonderful marketing piece and available in a variety of sizes up to 48×96. Place your order and receive your Banner in just two days with free overnight shipping. Please Note: Offer applies to vinyl Banners only and does not include Pop-Up Banners. The sale price will not be reflected in order summaries and email confirmations. The discount will only appear after the order is transmitted and received by the lab. No refunds on orders placed prior to the sale. Offer expires at 11:59 p.m. (Central) on January 11, 2015. Hi Mary, your banner can feature as many images as you would like. There is no cost per picture, only the size of the banner changes the price.